More fun at Scrap Pink! So I got the call today and it's official! The ladies from Diamond Cuts will be joining us again at Scrap Pink for those awesome mini pedicures and foot detox at the incredible price of $10.00 each. They even said they may have some additional services for us but are keeping it secret!! YEAH us, we get to scrapbook, get pampered, eat chocoloate..........oh my how many days is it? We have been given an INCREDIBLE room rate of $69.95 per night for a double, King or Queen room at the Holiday Inn in Joplin. This is the host hotel for our November Memory Round-Up Crop. For those that stayed at the Holiday Inn a few years ago during our event please know that they have done a complete remodel of all the rooms. I was very impressed when we toured the facilities! The Scrap Pink T-Shirts are now available on Pre-Order until September 5th! Printed on high quality 50/50 blend black t-shirts with pink ink and glitter. Order yours now at http://www.kisscropnshop.com/shop under apparel. Shirts will be delivered at Scrap Pink Crop on September 18th and 19th. **Proceeds from each shirt sale will be donated to Local Breast Cancer Research! ***You do not have to attend Scrap Pink to order your shirt and help a great cause. Just add in comment section during checkout that you would like your shirt shipped and we'll add $4.95 for shipping to your accoutn when your shirt ships. 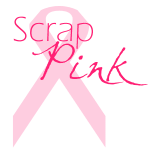 What a pleasant surprise to wake up and see all the registrations rolling in for Scrap Pink!! You ladies are ready to scrap aren't you? So am I and nothing is better than getting to scrap and help a good cause at the same time!! If you haven't registered be sure to do so at http:www.kisscropnshop.com!! I'm off to an auction, haven't been to one in many, many years. I remember going to them with my grandpa Martin when I was younger and always found them interesting. Who knows maybe I'll come home with some goodies today! Well, almost! 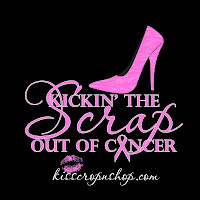 Scrap Pink Registration opens August 15th at http://www.kisscropnshop.com. Come join us as we celebrate being women, fellowship, scrapbook and raise money for Local Breast Cancer research! We'll have all the exciting things you've come to know at a K.I.S.S. Event including a guaranteed door prize for everyone attending, drop-n-swap, chocolate fountain and soooo much more!! $10.00 of each registration will be donated to local breast cancer research.